The time is now to present to you jewelry by the late Santo Domingo jeweler Tony Aguilar, who I would consider a true master jeweler. In the wonderful jewelry of Tony Aguilar, we can see a varied body of work that combines expert traditional techniques with new stylistic designs. Tony Aguilar's life certainly influenced his jewelry. He was born in 1919 at Santo Domingo. From a family of jewelers including his own father and his uncle, Vidal Aragon, Tony Aguilar learned silversmithing from a Navajo jeweler while he attended the Santa Fe Indian School. 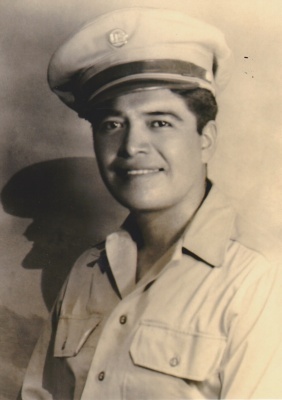 The president of his class at the Indian School, Tony entered the United States Army during World War II. For 2 1/2 years, Tony Aguilar was stationed in Iran, and while there he admired the heavy, ornate jewelry designs of Middle Eastern jewelry. Tony would return to the United States highly influenced by those jewelry designs. The resulting jewelry that Tony Aguilar created post World War II was often bold, big and brass with intricate stampwork and large natural turquoise stones. Tony's frequent use of brass was quite exceptional, for brass is actually very difficult to work with and very few jewelers can create brass jewelry that does the metal any justice. Tony Aguilar was one of the few who could. His brass work is some of the best around! Notice the wonderful brass designs surrounding this massive turquoise ring or the wonderful brass barrel beads on this Tony Aguilar turquoise necklace. Besides his expert brass work and innovative designs, what makes Tony Aguilar so amazing is his versatility. He was able to do traditional Santo Domingo turquoise work with the best of them. He hand-cut and hand-rolled the finest natural turquoise and coral to create perfect joclas, and traditional multi-strand Pueblo necklaces. Look at this amazing 12 strand coral necklace. It is just superb! Like many American Indian families, Tony Aguilar often worked in concert with other family members. He finished this abalone shell choker necklace with his wife Ernestine. Tony Aguilar passed away over a decade ago, but he has left a lasting jewelry legacy. He had six children, and his youngest son, Wayne, is carrying on in Tony's footsteps. Wayne Aguilar creates jewelry in a style somewhat similar to his father using Tony's old stamps. This 5 strand turquoise necklace by Wayne Aguilar is quite reminiscent of his father's work. I am especially thrilled because the Aguilar family has recently entrusted me with selling some of Tony Aguilar's important pieces including this turquoise and barrel bead necklace and this traditional Santo Domingo shell necklace. These special pieces have never before been outside of the Aguilar family. I hope you enjoy the beautiful work of Tony Aguilar (and family).